Antibiotics don’t work for viruses such as colds or the flu—ask about natural alternatives for cold & flu season. 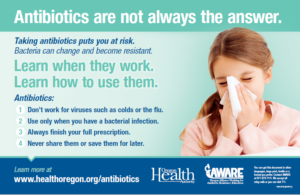 Antibiotics cure infections caused by bacteria; but they have no effect against infections caused by viruses, like a cold or the flu. Taking antibiotics for a cold or the flu is unnecessary and expensive. It can also cause a serious problem—antibiotic resistance—which means these drugs are less effective when they are really needed. We all have a role to play in preventing this. Patients, healthcare providers, hospital administrators, industry, policy makers and the general public can work together to promote appropriate antibiotic use – ultimately saving lives. 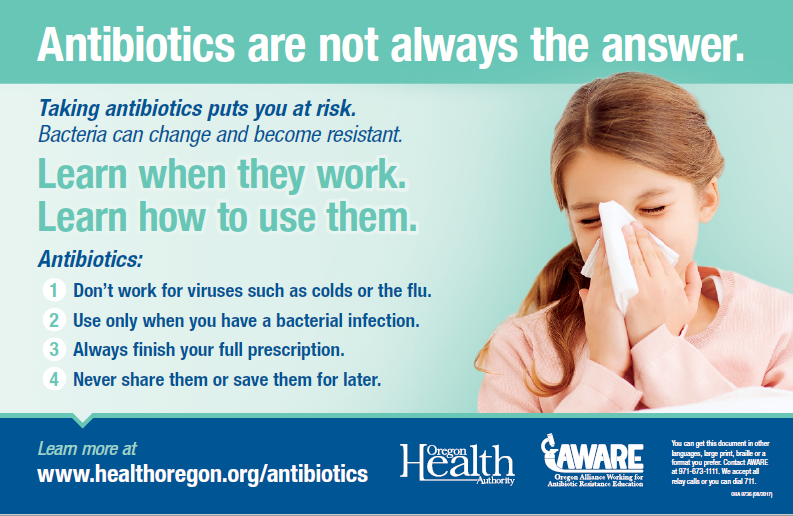 AWARE is the Oregon Alliance Working for Antibiotic Resistance Education.